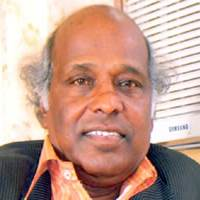 Rahat Indori is a well-known Urdu shayar and lyrics writer. He was born in 1950 in Indore and did his basic education from there. He completed his MA in Urdu literature from Bhopal and achieved his PhD from Bhuj University of Madhya Pradesh. His childhood was a tough one as the family was going through a financial crisis, so he began to work as a sign-painter at the tender age of ten. Rahat took up a teacher’s job in Urdu literature at IK College, Indore and got engrossed in mushairas and began to get invitations from everywhere in India and abroad. He was a good student and also the captain of the football and hockey teams at school and college levels. He recited his first sher in his college days when he was only 19. He is the recipient of a number of national and international awards for Urdu sher-o-shayari. He is also a popular lyrics writer in the Hindi film industry.